Henry has blessed us with another gorgeous photo shoot as he graces the cover of this month’s issue of Square Mile magazine! He discussed a lot in this interview, including the much-awaited Mission: Impossible – Fallout, being Superman, some of his earlier projects, and much more. Check out the two covers and some outtakes in our gallery. Cavill is bigger: north of 6ft, and with a build to make a wardrobe search for the nearest brick shithouse to cower behind. Your grandmother would describe him as a “strapping young fellow”, while your wife quietly slips her wedding ring into the nearest drawer. Never has a man looked quite so obviously Leading. A cinematic star needs a cinematic setting – so we recruited the Shangri La penthouse at the Shard, and thus half of London sprawled out beyond gigantic panes of glass. We have gathered on the X floor of Europe’s tallest building to discuss Cavill’s role in Mission: Impossible – Fallout; or rather the little that Cavill can discuss about his role in Mission: Impossible – Fallout. Refreshingly for a modern blockbuster – where spoilers are tossed into the first trailer, and the plot can be deciphered a month before general release – very little is known about the sixth installment of the M:I franchise. Naturally, it stars Tom Cruise as daredevil superspy Ethan Hunt, naturally there is a countdown to an imminent global catastrophe, and naturally a lot of vehicles will blow up. Which is fortunate, as the trailer promises plenty of collateral will be duly damaged. Including the leading man: Tom Cruise broke his ankle chasing Cavill across the rooftops of London. (Fortunately for on-set harmony, the men were filming at the time.) Cruise, the utter pro, finished the take, but production was halted for several weeks. Read the full interview over at Square Mile. Apologies for being about a week late on this, but here are some interview videos that Henry did during the CinemaCon 2018 last week. 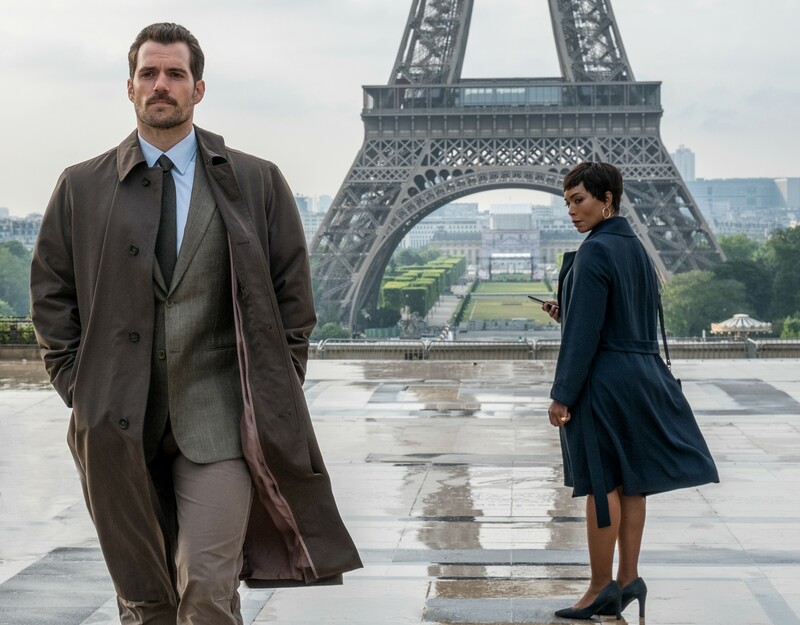 Henry primarily talked about Mission: Impossible – Fallout, his character Ethan August Walker, working with Tom Cruise, doing his own stunts, and of course his mustache. Additionally, he discussed Man of Steel 2, his DC contract, and more! The cast of Mission: Impossible – Fallout appeared in last Friday’s episode of The Graham Norton Show. Graham and the cast discussed several things, including Tom’s injury with his ankle, the helicopter sequence, how the cast spent their first big paycheck, and much more. Henry mentioned his character’s name, and it’s August Walker. Tom also mentioned that the first teaser trailer will be shown during the Super Bowl on February 4th. Official images have also been shown during the show, and I have added the one featuring Henry into the gallery, thanks to Annie at Tom Cruise Fan! Check out some clips below and screen captures in our gallery. Henry spoke with Los Angeles Times during the Justice League press junket in London early this month. He discussed Superman’s return in the film, and confirms he’s still contracted for at least one more film to appear as the Man of Steel. By now it’s likely not a spoiler to reveal that “Justice League” includes the return of Superman, who sacrificed himself to save humanity at the end of 2016’s “Batman v Superman: Dawn of Justice.” That film, which was generally regarded as overly dark and somewhat unwieldy, gave audiences a version of Superman (Henry Cavill) that felt morose and off-base from the comic books. Here, filmmaker Zack Snyder — as well as Joss Whedon, who stepped in to direct the re-shoots — uses “Justice League” as a chance to reestablish the character. Superman was largely left out of the marketing campaign for “Justice League,” and most of the cast and the filmmakers did their best to keep the revival a secret for as long as possible. But fans, especially those familiar with the comic books, had been speculating for months, asking: “How can you have ‘Justice League’ without Superman?” One of the only clues for his return? Reports that Cavill’s mustache for the upcoming “Mission Impossible” sequel had to be digitally removed during the re-shoots, meaning that Superman would be somewhere in “Justice League” (“That damn mustache,” Cavill jokes). As it turned out, the studio always intended to include Superman but did its best to keep the rollout spoiler free. The process by which Batman (Ben Affleck) and the other members of the Justice League bring Superman back to life is complicated, involving several scenes that would be impossible to fully explain here. Suffice to say that Superman’s lifeless corpse (which was not played by Cavill for these scenes) is not lifeless for long. And ultimately, it’s Superman’s reaction to being awoken from death that’s more interesting than how he’s actually brought back. His initial anger and confusion shift to an emotional confrontation with himself over what’s happened to Lois Lane (Amy Adams) and his mother, Martha (Diane Lane), since his death. The Big Six attended the world premiere of Justice League in Los Angeles last night. I have added high-quality photos of Henry at the event into the gallery! I’ll add more pics when I get more, so check our gallery again soon. Also, fans were able to stream the red carpet premiere live, and you can check out the full coverage below. Henry’s interview is around the 43:25 mark.